This cake has had the most views since we started putting up our cakes on Flickr. It is made using 3 tiers of cake which can consist of chocolate with a chocolate buttercream filling, lemon maderia with a vanilla buttercream, carrot with a cream cheese filling or traditional fruit cake. 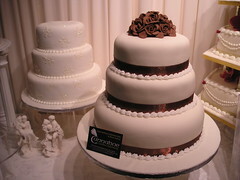 The cake is covered with an ivory sugarpaste and then stacked and piped. The ribbon is a chocolate brown and the flowers are made with chocolate paste which we make ourselves. The colour can be changed to suit the wedding colours. It is one of our classic cakes.